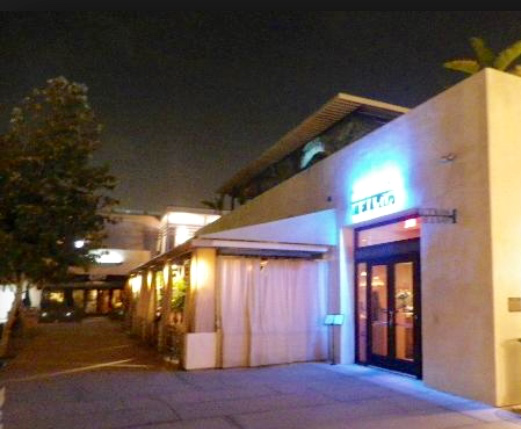 It’s not just the authentic Greek food, or the stellar customer service, or the ambiance of Petros in Downtown Manhattan Beach, but it is the overall dining experience that is simply aces at this restaurant. Imagine dimly candlelit tables under a tent-like overhang, in the fresh and salty sea air, couples as well as large groups, gathering together to sip wine and delight in fantastic food in a very un-rushed way. We arrived at Petros on a lovely late summer evening not knowing exactly what to expect and we could not have been more pleased. We were seated immediately at a lovely little table for two outside, excellent service from our waitress who had plenty of suggestions for us in food and drink. You could hear others talking around you, and even a few tipsy women cackling on their “girls’ night out” together, but defnintely not too loud to have a pleasant yet private conversation over dinner. We started with the feta bruschetta and nikos saganaki…Both were just delicious! For dinner we chose the Chilean Sea Bass with chopped grilled veggies and melt in your mouth mashed potatoes as well as the Grilled Ahi Tuna and Horta with beet greens and an heirloom tomato salad with feta, capers and chopped olives. What a flavorful feast… Simply sublime! I cannot imagine a better overall restaurant experience. If you have not been, you must go! If you have been, then treat yourself to a return trip! Petros is the cream of the crop in my book! Sesame Moe’s: What It Lacks In Service, It Makes Up For In Taste!